Paige Hill: Where IS my Wonder Women suit???? Let's hope it motivates me. 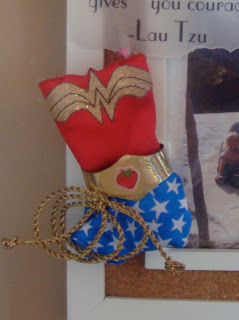 I mean really, how often do we need a "Wonder Women" suit just to get through the day? Right now I'm wondering when I will have the motivation to tackle the Leaning Tower of dishes in my sink, the MOUNTAIN of laundry to be washed, and the mess that I now call my closet? Not to mention take the dog for a walk and take a shower. Don't get me wrong. I absolutely love my job. Love being able to stay home with Emma. Love having the opportunities I have. But really, can't I just have a maid? Or a magic suit that I can put on when I actually need to clean up this house? Or go to the grocery store? Is that too much to ask? Probably ... So I'll stick with my motivational Wonder Women suit... Hey, I think it's working! Maybe I'll go down and do the dishes. Then I'll hit the laundry. Oh, and I could organize my closet! Wait ...On second thought, I think I'll go and color the sidewalk with Emma. Doesn't that sound like a better time? that they're running to celebrate TCC ... There are some FABULOUS prizes! I didn't even know they made a Wonder Woman Barbie. Very cool little outfit. I think I would keep it as well. Love, love, love the Wonder Woman suit. I bet it will be a great source of inspiration for you in your office. 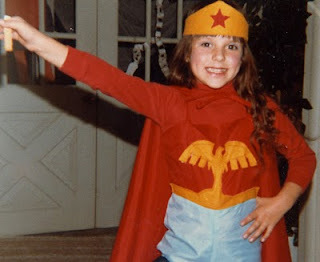 I think I had a Lynda Carter Wonder Woman doll in the 70s. I wonder what happened to her? !